A tourist has broken the record for lifting the famous Dinnie Stones. Bryan Hunsaker from America held the 733lbs (332kg) boulders at Potarch in Aberdeenshire for 33.9 seconds - beating the record of 31 seconds. Mr Hunsaker, a 6ft 8in tall, 22-stone amateur weightlifter, travelled to the area while on holiday in the UK to take on the challenge. 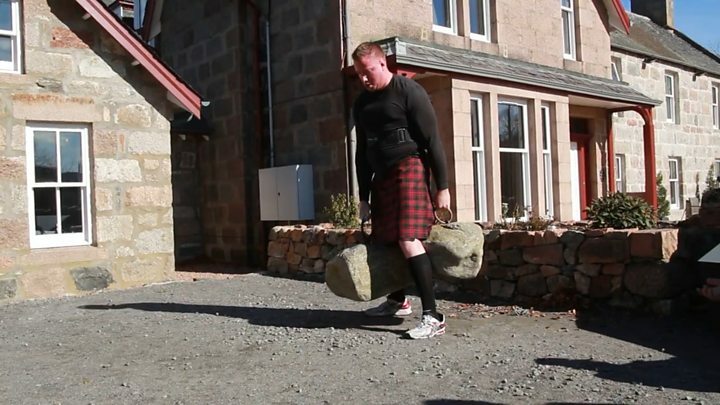 The 36-year-old's family watched as he lifted the granite boulders challenge, dressed in a kilt. The smaller of the stones weighs more than 144kg (318lbs) and the larger is more than 188kg (414lbs). Iron rings were attached to them in the 1830s so they could act as counterweights for scaffolding during the maintenance of Potarch Bridge. In 1860, Donald Dinnie carried them across the width of Potarch Bridge and back. Mr Hunsaker had learned of the stones via the weightlifting community. The vitamin exporter told the BBC Scotland news website: "I had known about them for about a year, and started training seriously for it about two months ago. "We were coming to the UK anyway so decided to try. "I realised I could hang on to them for a while - to beat Mark Felix's record is quite something." Ballogie Estate marketing co-ordinator Helen Knowles said of the new record: "We timed it with a stopwatch. He was very determined - and absolutely delighted." Attempts to lift the stones have to be made by arrangement, to protect the stones.